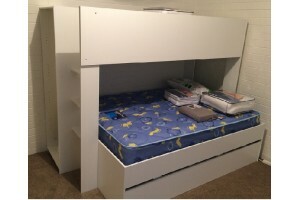 We are really exited to announce our latest bunk bed, that comes with optional trundle or drawers. While this new product is a natural progression from our other designs and retains many of their popular features: sturdy design built in bookcase, the main progression was to raise the bottom bed to create space for under bed storage or a third bed / trundle bed, which makes it more versatile, than say our mid height bunk bed with bookcase that has the bottom bed very close to the floor. Thanks to the suggestion from a recent customer (thanks Kate!) and in keeping with our policy to design safe beds we have offered this new design in two heights a tall version and a shorter safer version. The tall option puts the top mattress base at 1350mm from the floor which is the maximum height allowed under the current Australian standard for bunk beds., while the shorter version allows for a safer design an easier access for younger kids. Despite raising the bottom bed the shorter version still maintains the same gap between beds as our previous low height / mini bunk beds. All in all if you multiply all those options together you get a staggering 72 possible configurations of this one product! That amazing flexibility even if you have to wait a bit for us to make it, is the fantastic benefit of buying locally Australian made products! The idea was to create a bunk bed that can sleep adults as well as kids in a compact space and after..
Over the last few months we have been researching and designing 2 new bunk bed designs to be release..